Integrative medical doctor Dr. Cris Beer joins HPR to promote the new immune health check being offered by Blackmores and also discusses her background in holistic/integrative medicine. Dr. Cris Beer is an integrative medical doctor, author, corporate speaker, and media doctor. She practices at the Medical Sanctuary on the Gold Coast. She has particular interests in preventative health, lifestyle medicine, hormone health, weight loss, fatigue and sleep problems, digestive issues, as well as women’s health. Wayne Bucklar: You’re listening to Health Professional Radio. My name is Wayne Buckar and my guest today is Dr. Cris Beer. Now, Cris is here to talk about Blackmores’ new immune health check. Dr. Beer is a medical doctor and she practices at the Medical Sanctuary on the Gold Coast where she’s today and has taken some time to talk to us. Cris, thank you for taking some time out. Dr. Cris Beer: Thanks for having me on the show. W: It’s our pleasure. Now Cris, you’re an integrative medical doctor or if you prefer integrative, can you just give us a quick rundown on what that means for those people who are listening who may not be familiar with it? B: Yes. An integrative doctor or a holistic doctor is I guess it’s not a new thing but it’s becoming a bit more recognised as a speciality and therefore, associated with accredited training with our various general practice or family physicians practice organisations really around the world. But it’s where we look at the evidence-based complementary management of conditions and combine that with standard or orthodox approaches to try and get the best outcome for the patient in really I guess the most natural means or the most non-interventional means possible. So that’s kind of the approach of medicine that I take. W: And I love in your bio, it says that you’re a real doctor with real patients and real health issues so you are a practicing physician. Cris, it’s winter and even on the Gold Coast, winter has arrived well and truly. It’s that time of year where there’s lots of sniffles and and issues. Why do you think people understanding their immune health is important at this time of year? B: I guess particularly because during winter months and when we do get a cold that what we have currently in Australia or on the East Coast. Particularly, people become quite susceptible if they don’t understand their feeling that early symptoms particularly run down or that they could potentially do things to boost their immune systems. I think it’s a good point to know and understand your immune system, how it functions, what you can do to try and boost your immune system and to improve overall body resilience to those bugs that are more common during the winter months and more commonly contracted during the winter months because we’re spending more time indoors in close contact with other individuals. It basically increases their exposure risks. And so I think it is important to understand your immune system. I think it’s definitely important for all those that are susceptible, the very young, the very old, those that have asthma, smokers, who work indoors in an office environment – those that are particularly prone to respiratory tract infections. I think it’s important and not just particularly for those individuals, that all of us really, if we don’t want to be missing weeks and weeks off work, I think that it has benefit for all of us. W: Why do you think people are, I guess, not aware of the things that improve their immune health? And specifically, what do you think it is about immune health that people are not aware of all? B: I think in general, we feel that our immune system is a given, that we’re born with a certain type of immune system and that’s it, and that we can’t modify it and that we can’t improve it or change it at all for the better. Also the worse for that matter, based on lifestyle factors in particular are the main things that can contribute to altering our immune systems for the better or for the worse. So yes, we’re not just born with particular type of immune system. Yes there is an innate or a genetic quality to our immune system and we do see traits of immunodeficiency run in families. But by and large, a part of our immune system is acquired and can be improved by some lifestyle factors, in particular basic things that we all know we should be doing that we don’t do. Those are things that can really make a big difference to our overall immune system – sleep, getting enough sleep in particular, vitamin D is one that we don’t often attribute to immune system health – we attribute it to better bone health but getting enough sunlight exposure therefore improving our vitamin D levels, also improves our immune system. So that’s an important one for most of us because we’re all working indoors or a lot of us are working indoors these days, and vitamin D deficient even here in Australia. So I think it’s important to know. W: Are there other specific things that affect our immune system Cris? C: Once again, lifestyle things are important to keep in mind – exercise. We think of exercise as improving our cardiovascular health or our heart health, improving once again our bones, weight loss, reducing our risk of chronic diseases like diabetes, but we don’t see it as improving our immune system. That research is showing that it can improve cell function or immune cell function and the efficiency of our immune cells and so exercise. And it’s not vigorous, extreme exercise that seems to suppress the immune system as we’ve seen in endurance athletes who tend to become quite susceptible to respiratory tract infections and we often see just before the olympics or Commonwealth Games, people can’t compete because of that. But for mild to moderate exercise, just getting a little bit of your heart rate up a couple of times a week, three times a week or they say 30 minutes three to five times a week has benefits for our immune system which we should all really be able to do to try and reset our immune cell function. So exercise is another one and of course, all the other things that we know. There are some supplements of things that people can take to boost their immune system or to complement their immune system or the lifestyle factors. But by and large, starting with the lifestyle things can really make a big difference. W: Cris, we wanted to talk to you today specifically because Blackmores have announced the launch of their immune health check and I do a lot of medical stories but I have to confess, I have no idea what an immune health check is or how you do one or even why it’s a good thing to do. So I know it’s something that you know about. 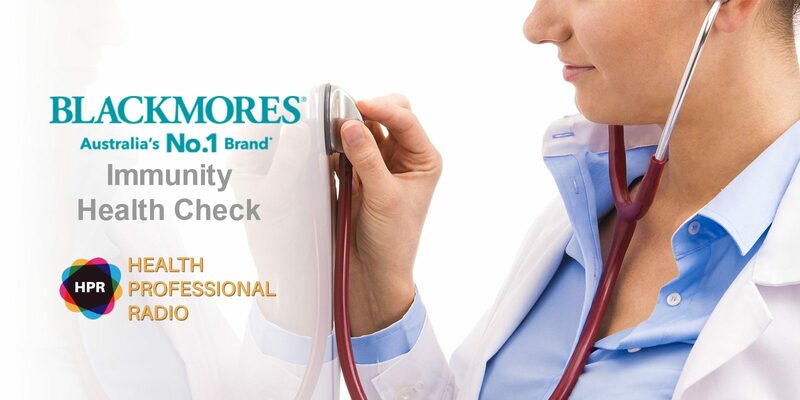 Can you tell us about the Blackmores immune health check? B: I can. I think it’s a great initiative from Blackmores is a lot of their aims have the same lines as their well-being check which a lot of Australians have undertaken and have found benefit from some of the advice given as part of that check. Your immune health check is based on a series of questions that you answer in a very user-friendly format and then at the end of that, you get your scores, your immune health score and it gives you what your score is out of a hundred and when you compare with your age average. And then week by week, there’s kits emailed to you about how you can improve some of the factors that were picked up as potential barriers to your immune health. So I think it’s a really user-friendly, it’s an easy way to understand your immune system, things that you can do on a weekly basis or a daily basis to improve your immune system and the things that we’ve been speaking about, plus extra little bits, and pieces, and tips, and things, recipes and all sorts of things. So I think it’s worth doing. It’s free obviously, it’s online, it’s easy to do and then they email you your scores and your results based on your average. W: I see. So it’s an online test and does it have its own URL or is it available through the Blackmores’ site? B: Either. It’s easier to access through the Blackmores site and you’ll be able to Google it and just Google “Blackmores’ Immune Health Check” and it will come up and then you can just follow the links and click and start basically, your immune health check. So I think it’s a good thing to do leading up to obviously well, we’re right in the middle of the winter months but yes, I think it’s worthwhile doing just to get an idea of where you are in your immune health score. W: Yes, it’s one of those things you don’t think about very often I have to admit, until you do get sick. So it’s probably worthwhile, particularly I guess for anyone who’s in any of those susceptible groups this time of year. Cris, we’re running out of time and I need to wrap up but what are your everyday immune tips? What do you tell your patients the kind of everyday stuff they can do? C: Everyday, I often look at the factors that are contributing to poor immune system if they are presenting with poor immune system. So address your sleep, get a really good night sleep, reduce your stress levels if possible or learn to dissipate some of that extra cortisol or that stress hormone through exercise, things like meditation, etc., having breaks from work if you can over the weekend. Look at improving your vitamin D levels, getting out into the sun everyday even if it’s just for 10 minutes to try and boost that vitamin D level. And for some of us, it seems like taking an extra supplement, so whether it be vitamin C which has got some research behind it in terms of immune boosting. Echinacea is another one that has research, and Zinc has a lot of research behind it for immune cell boosting. So I think those are key nutrients can really help people and they’re often found in immune boosting supplementation. There’s other things obviously like probiotics that have a lot of research behind it as well in terms of immune system and prevention of allergies and in support of gastrointestinal health. So I think all of that together, you’ll often find that they’re immune support types of supplements and that can help a lot of people and some people swear by them. So I think that it’s worth investigating and having little catch. If you are still struggling with recurrent infections, do get it checked by a doctor, do have a full checkup, do have a set of bloods done if that’s what’s indicated by your doctor and make sure there’s nothing else going on. But I think it is worthwhile that people understand their immune system and take care of it. W: And Cris, a lot of our audience are clinicians of one kind or another. What’s your take away message for health professionals? C: Well we’re the worst when it comes to looking out for ourselves. I mean we’ve proven that time and time again when you look it up, our demographic and our health respectively, unfortunately, we do not practice what we preach a lot of the time. And by and large, you have that phenomena whether it’s because we’re so busy looking after everyone else that we don’t have time to look after ourselves. But I’d say we’re very, very susceptible because we are working with sick people, because we are in contact with those that are carrying some of those illnesses that are particularly contagious. I think that we need to really address our lifestyle factors to things like sleep, things like stress, things like coffee and alcohol intake, vitamin D levels, exercise. Start with the basics and then work towards improving your immune system but take the immune health check, you’d be surprised. It’s been obviously tried and tested and it’s sometimes reassuring but it’s quite informative and the information that it provides you and also giving you an idea of where you’re at, you’d might be surprised. The first time I took the immune health check, I had two small children and so my sleep is quite broken. My score was shocking, it was below of what it should be for my age. And so week by week, I’ve worked on some of the tips and yes, it has made a difference to my score so I think that is worth doing. W: Dr. Cris Beer, integrative medical doctor from the Medical Sanctuary, thank you for being with us today. I do appreciate your time and thank you for telling us about Blackmores’ new immune health check. B: Perfect. Thanks Wayne, thank you. W: And if you just joined us on Health Professional Radio, then you’ve just missed my chat with Dr. Cris Beer and that’s a pity because it was an interesting chat about immune health and in particular, an online immune health check that’s now available to you. But the good news is on our website, we have a transcript where you can read the whole interview or if you prefer to listen, it’s also available as a podcast on iTunes, SoundCloud and YouTube where you can download it and listen to it at your leisure. This is Health Professional Radio, my name is Wayne Bucklar.